Avaliable in paperback from Amazon and in audio book from iUniverse. Every Western expatriate anywhere in the world has been asked the same questions during trips home or via letters and emails: Do they celebrate Christmas over there? What are the people like? Is it safe over there? When was the last time you went to church? The answers are usually too complex to explain without causing the inquisitors’ eyes to glaze over and the result is canned answers that reveal little: Yeah, sort of; They’re inscrutable but nice; Yes and no; and Sometime during the Reagan Administration. 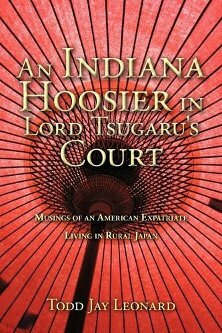 For this reason, Todd Jay Leonard’s An Indiana Hoosier in Lord Tsugaru’s Court: Musings of an American Expatriate Living in Rural Japan is not only a book to read before you come to Japan, it’s a book to leave with your parents because it answers most of the questions you, and they, will have about your time here. The book consists of a series of columns Leonard wrote for his hometown paper in Indiana and is offered as a sequel to his previous volume Letters Home: Musings of an Expatriate Living in Japan (iUniverse, 2003). It is arranged by theme: Todd’s Top Ten List of Things Japanese; Rites of Passage; Japanese Festivals and Celebrations; Political, Educational and Social Issues; and Cultural and Societal Miscellany. It covers a wide range of material and topics from hot-spring baths and coming-of-age ceremonies, to waving cats and space-age toilets. Leonard’s most impressive accomplishment is his ability to present the information objectively without coming across as a know-it-all (a condition rather common in people, men in particular , who write about Japan). He also, in an equally impressive feat, manages to celebrate Japan without trashing the West. He acknowledges a few western things he both misses and prefers and even describes a number of Japanese flaws. Your humble editor especially likes his analysis of Japan’s rising teen crime rate in his answer to the "Is it safe over there" question. He gives good summaries of political and educational issues that manage to name all the key players and events without getting confusing. He answers the Christmas question in succinct fashion and describes the disappointment Japanese have when they discover Christmas cake is not a part of the traditional Western celebration. He even hints at a fault with the Japanese way of celebrating: “Behind all the glitz and glitter … the actual reason for celebrating the season is noticeably absent here.” This section is accented with a description of his own shock at seeing Santa Claus on a cross. If the book has any flaws it’s that, because it is a series of columns, it tends to be a bit repetitive at times. Some topics are mentioned, then mentioned again, then discussed in more detail. Stylistically, your humble editor wishes Leonard had spread his top 10 list out and used it as breaks between the different sections. He also feels that Leonard unfairly trashes the Japanese version of Valentine’s Day (where the women give chocolate to the men) while giving short shrift to White Day (where men are supposed to reciprocate). Your humble editor unconditionally supports any holiday that involves him getting free chocolate and likes that the burden, at least in theory, is shared equally. Still, these are minor issues. Your humble editor encourages you to rush out and order two copies, one for yourself and one for your parents. He also encourages you to check out Leonard’s previous books. Copyright © 2002-2010, Dwayne Lively. All Rights Reserved.